The Czech Republic is part of the EU but it has not adopted the Euro (EUR). Nobody knows for sure when Czech will adopt the Euro if ever. 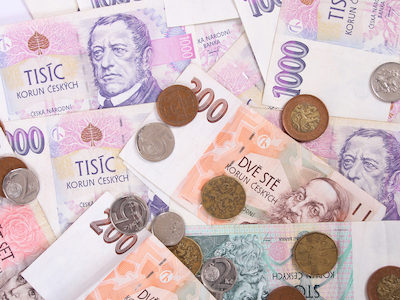 The currency in the Czech Republic is the Koruna, also known as Korun and abbreviated as CZK. Since I am from Canada I know the Canadian dollar exchange rate very well. Using a simple trick I can quickly convert from dollars to Czech Koruna. Because the US, Euro, GMP are very close to the CDN, for a quick estimate of price, my formula will work for you if you are from EU or USA or Canada or Australia. 1 CDN/US/EUR/AUD/GBP = 20 CZK (approx). For this trick all you need to do is remove the last digit from the price and then divide by 2. For example, if something is 500 CZK, you remove the last digit (0) which leaves 50. Then divide 50 by 2 which leaves 25. 500 CZK = 25 CDN/US/EUR/AUD/GBP (approx). This method is good enough for getting a quick estimate of price. For instance, when the Taxi driver extends out his hand and asks for 800 CZK you can quickly estimate that it is around 40 dollars. This is the safest way. Arriving in Prague you will have bills in hand ready for anything. No stress, no pain. But there are drawbacks. You will receive a poor exchange rate. The Koruna is a not an international currency and banks outside of the Czech Republic do not hold it in abundance. So they will charge you for the convenience. Secondly, you will need to carry around all that cash. If you lose your wallet, your bag, or your pants, the money is gone. This is an option if you have a popular currency like the US dollar or Euro. With these major currencies you will receive a favorable exchange rate. But if you come with Somalia Shillings then you could be out of luck. Better exchange that in your home country. The only piece of advice I would give is: do not exchange your money at the airport – they do not have competitive rates. Wait until you get into Prague center where there is competition amongst currency exchanges and so offering a fairer rate. Amazingly there is a problem with tourists getting ripped off from people exchanging currency in the streets. Don't echange your money with strangers on the street. I find this obvious - if a stranger walks up to you and offers you to exchange currency walk away. Go to a real currency exchange to exchange your money. This is my preferred method. After many years of traveling around I found that in the end this method is the best. No need to worry about getting the exchange done before you leave, deciding how much to exchange and then running out of money anyway. You arrive, find a bank machine and take out just enough for the next few days. That way you do not need to carry a whole wad of cash, you do not need to compare rates, and you will not be left with foreign currency if you overestimate. Of course the drawback is that you are not getting the best rate. And there is usually a service charge for using a foreign bank machine. For me, with a Canadian bank account, the service charge is $5.00 Canadian. If I take out enough money for a couple of days then $5.00 is a small price to pay for the convenience. With this method you can travel anywhere without ever having to think about currency exchange again. By using bank machine and paying a $5.00 fee you are suddenly in a world with one currency.